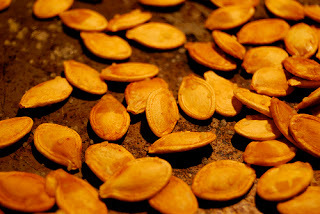 Remove and rinse the pumpkin seeds. Lay flat to dry on a paper towel. Preheat oven to 300-degrees. Spread seeds in single layer on a large cookie sheet. Sprinkle salt and garlic powder. Season to taste. Place in preheated over for an hour to an hour and a half. Store in an airtight container for up to 1 week.